This picture shows Grey Street, Newcastle, when it was still just a twinkle in the eye of the developer Richard Grainger. 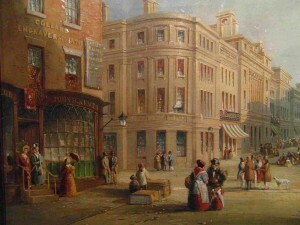 The scene is an ‘artist’s impression’, painted by John Wilson Carmichael for Grainger to show to investors, Newcastle corporation, and others to convince them that Grey Street would be a glamorous and stylish centre for business, banks and shops, and worth the enormous expense of building. The brick buildings nearest the viewer show the top of Dean Street as it was at the time. This historic painting is on show in the exhibition ‘19th-century Art in Newcastle’ at the Laing Art Gallery until April 29th 2012. 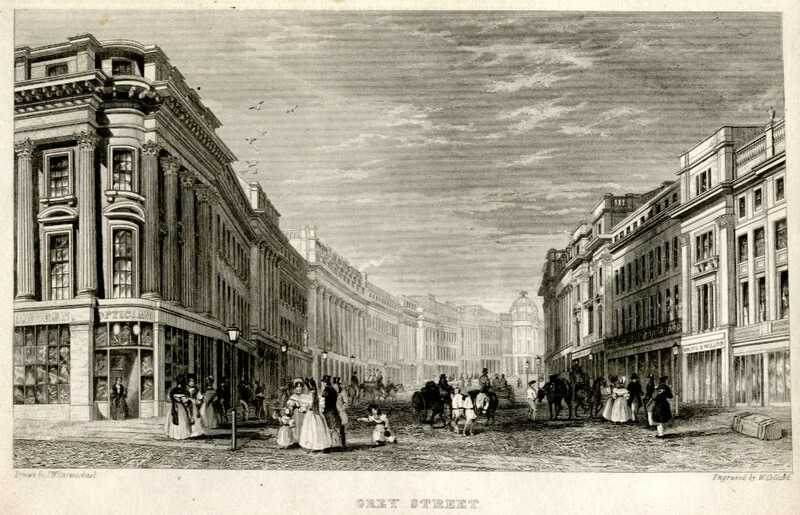 Grainger started building Grey Street from 1835. 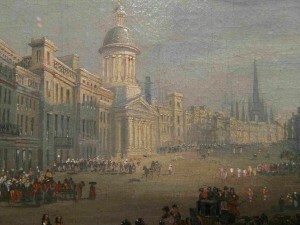 Carmichael’s picture is dated 1831 and so shows that Grainger was planning Grey Street much earlier than previously thought (the date has been examined under magnification, and is 1831, not a misreading of 1834). The general appearance of Grey Street today is very much as Grainger envisaged. 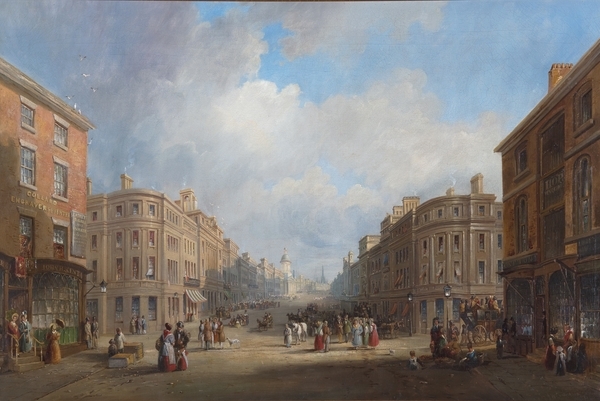 The grand building in the centre of this detail from the background of Carmichael’s painting was probably intended to show what a new Theatre Royal could look like. Grainger’s plans to build Grey Street meant that David Stephenson’s Theatre Royal (built 1788) in Mosley Street had to be knocked down. In actuality, the new Theatre Royal was built at the top end of the street. Its pillared front does have some similarity to the imagined building in the painting. Carmichael’s picture shows two contrasting shopping experiences. Right in front of the stylish shop, a woman has set up a roadside display of produce for sale. 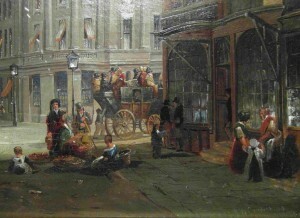 A stagecoach in the background is travelling along Mosley Street. It’s crowded with passengers sitting outside, well wrapped up against the breeze (the fare was cheaper than inside). 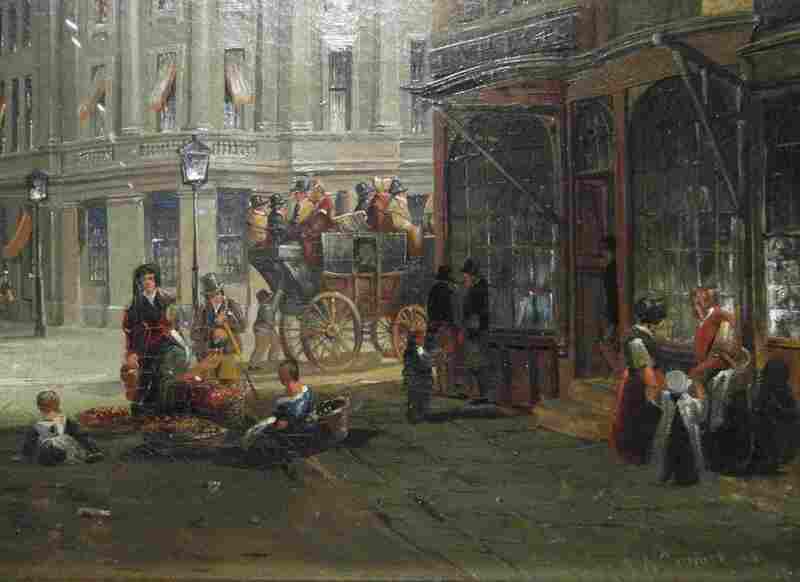 On the left side of Carmichael’s painting is the shop of William Collard, who was the engraver for many of Carmichael’s paintings and drawings. It seems that Collard’s shop fronted both Dean Street and Mosley Street– it is recorded in the Newcastle directory of the time at 22 Mosley Street. 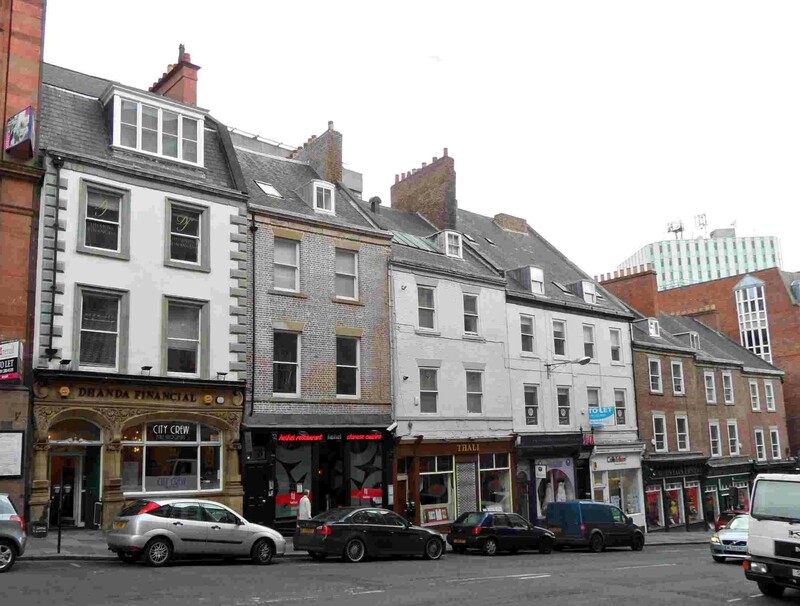 Collard’s shop and the facing building at the top of Dean Street are part of the previous development in Newcastle in the 1780s, designed by Newcastle architect David Stephenson (1756-1819). The buildings’ rectangular shapes, restrained decoration, and regular placing of windows were very different to the overhanging gables, decorated strips of windows, and black-and-white half-timbering of earlier buildings. The two shops Carmichael shows on the corners of Dean Street are no longer there. Some buildings from the same time are still standing in Dean Street, but the shop fronts have been changed quite a lot since they were built. 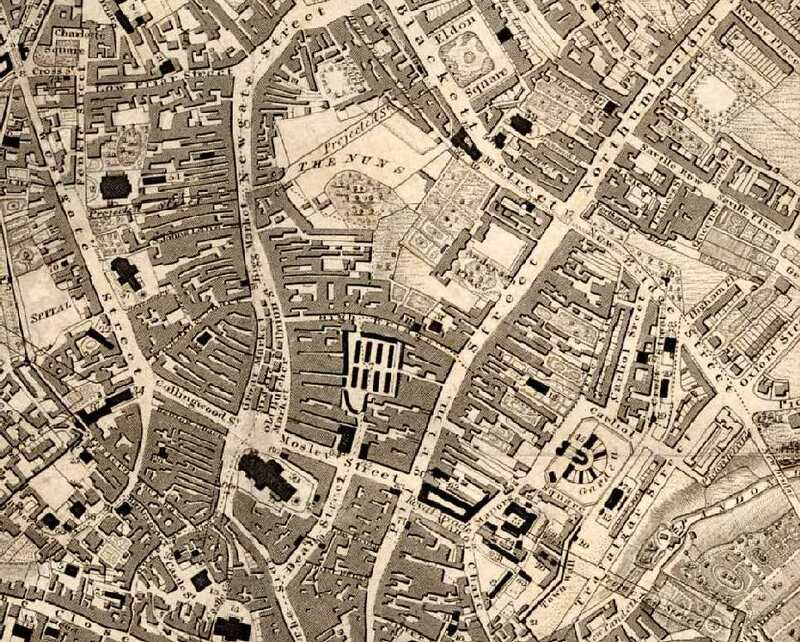 A map produced by Thomas Oliver in 1833 shows the layout of the town before Grey Street was built. Dean Street is at the bottom of the map section, to the right of St Nicholas Church (now Cathedral). 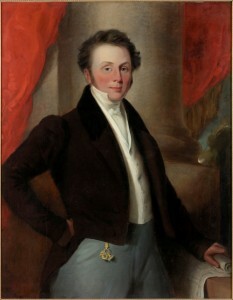 Richard Grainger bought the huge estate of Anderson Place after the death of its owner George Anderson in 1831. 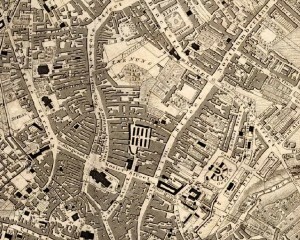 The estate is shown in between Pilgrim Street and the area marked THE NUNS on the map. Grainger also bought Nun’s Field at the same time (long before, it had been the grounds of a nunnery). The new Grey Street was built over Anderson Place– Lloyds Bank occupies the site of the house. The construction of Grey Street meant that the meat market (shown as a roughly rectangular black outline around 8 black rectangles) had to be demolished. 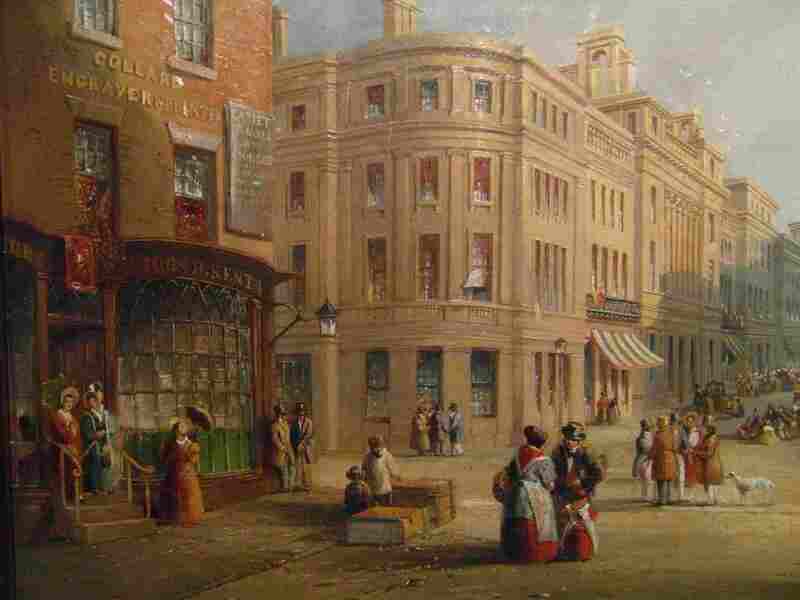 However, Grainger persuaded Newcastle council to sell him the old market and buy a replacement from him – this was the Grainger Market, opened in 1835. After this, Grainger could get on with developing Grey Street. The capabilities of this piece of ground, twelve acres in extent, seem to have long engaged the attention of Richard Grainger, Esq., whose enterprising mind had been early attracted to the vacuum, as it might be called, in the very heart of the town. Carmichael’s painting certainly supports the idea that Grainger had already been thinking of how he might develop the land before he bought it. Grainger’s building scheme created another 8 streets, including Grainger Street. The carriage road of this, as well as of the other new streets, is Macademized; a wide flagged foot-path on each side affords a convenient promenade to the pedestrian who may be disposed to examine the numerous splendid shops, &c., which sparkle in the sun-beams or the gas-lights around him. 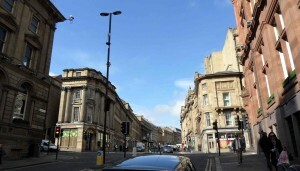 The buildings on the western side of the street, on the left of the picture, were designed by the architects John Wardle and and George Walker, who were employed in Grainger’s offices. 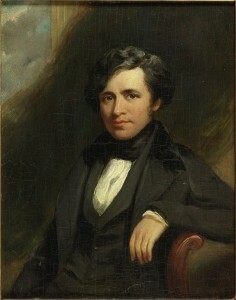 Other buildings were designed by other local architects, such as John Dobson. 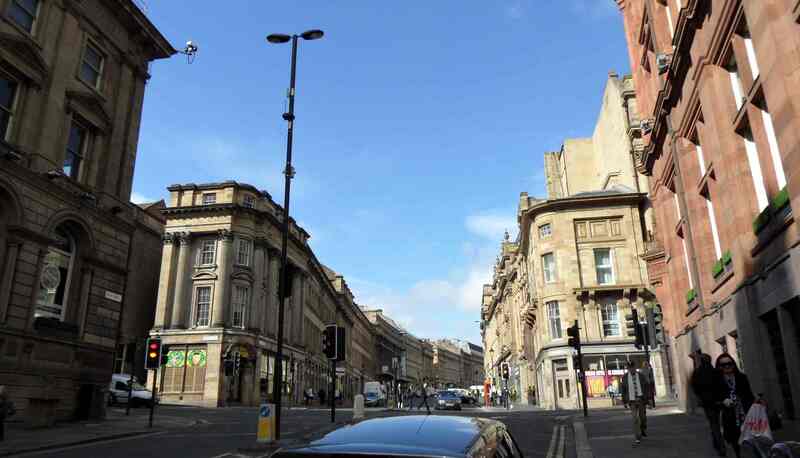 Grey Street was an important addition to the routes through Newcastle. Previously, Pilgrim Street and Side had been the two main streets from Mosley Street to the north of the town. This print from a design by Carmichael of the upper part of Grey Street shows the busy roadway. Grainger had kept a domed building as a focal point, but moved it to the top of the street – this is the Central Exchange Buildings. The Theatre Royal is on the right. 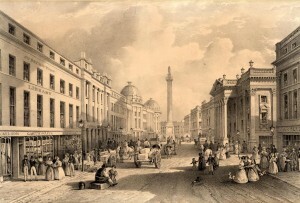 The Monument to Earl Grey, in the centre of the view, was completed in 1838, creating a spectacular new culmination to the view up the street. Grey Street was described by renowned architectural historian Nikolaus Pevsner as ‘one of the finest streets in England’. In 2002, it was voted ‘Best street in the UK’ by BBC Radio 4 listeners. The street is a central part of the Grainger Town Conservation Area. 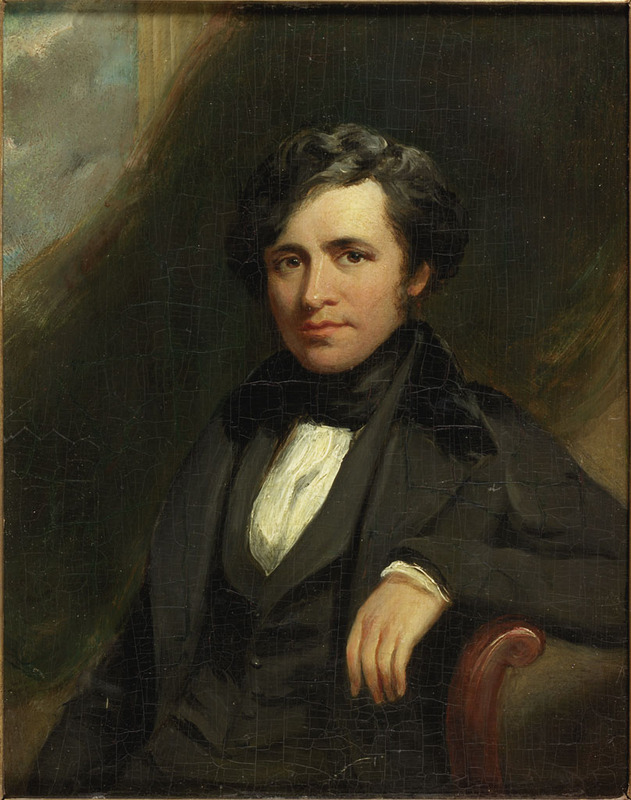 Richard Grainger (1797-1861) was a remarkable man. He didn’t come from a wealthy family – his father was a quayside porter. He set himself up as a builder at the age of 20, and quickly expanded his business, helped by marriage to the daughter of a wealthy merchant. Grainger built several important building projects, including old Eldon Square in 1824-26 and Leazes Terrace in 1829, before developing the Anderson estate. never before such extensive improvements effected in any one place by any individual; and that our canny town, “the coal-hole of the north” now stands, through his exertions, as proudly pre-eminent for architectural beauty, as it has …done for …mercantile enterprize and respectability. Carmichael’s painting of the proposed design for Grey Street remained in the Grainger family until the picture was sent for sale at auction. 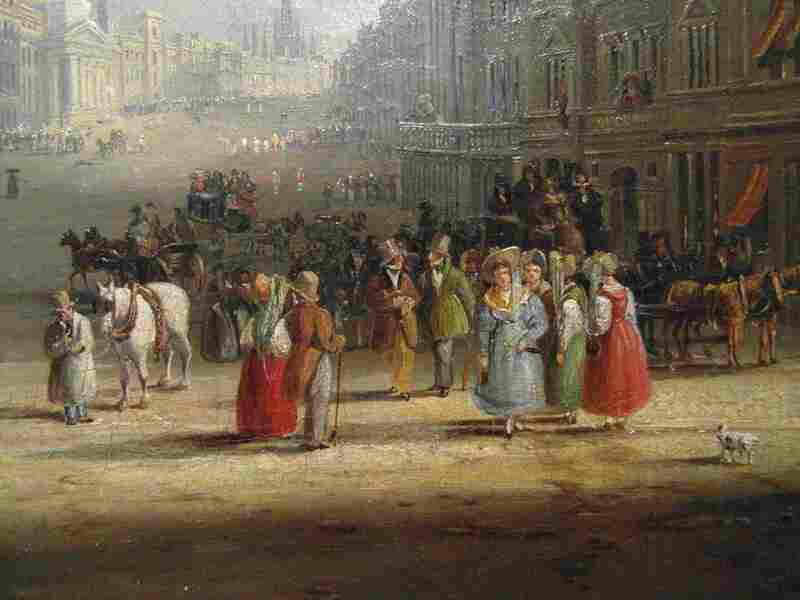 The subject of the painting and its importance for Newcastle was then spotted by Dr Grace McCombie, co-author of the Newcastle and Gateshead volume of the Pevsner Architectural Guides: City Guides. 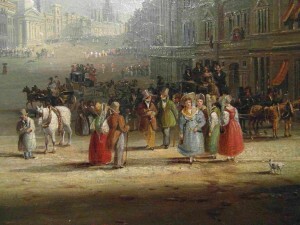 The painting was bought with the aid of a grant from the MLA/V&A Purchase Grant Fund. More information about Grainger’s transformation of Newcastle can be found in these publications: A City of Palaces. Richard Grainger and the making of Newcastle upon Tyne, by Ian Ayris, and John Dobson: architect of the North East, by T. E. Faulkner, Andrew Greg. Both can be viewed in the Local Studies section of the City Library, and are published by Tyne Bridge Publishing. 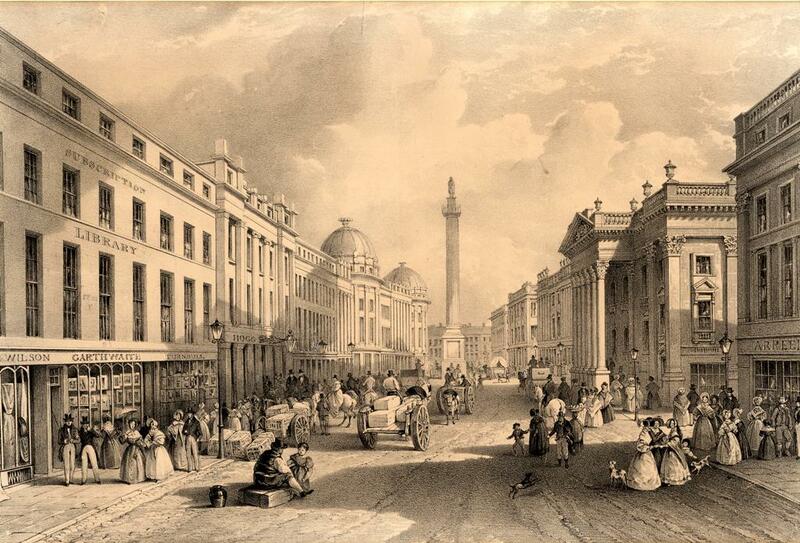 John Wilson Carmichael, ‘Proposed new street for Newcastle’, 1831. I have a man in Australia whose ancestor had a boot and shoe making shop in Grey St on 1851 census.He employed 10 men so it must have been a large premises.His name was Newton. Would you have any details as my friend is coming to England in December. George Newton, bootmaker, is recorded at 65 Grey Street in Ward’s Directory of Newcastle for 1850. The Local Studies Library on the top floor of the City Library has directories and other information that can help you. 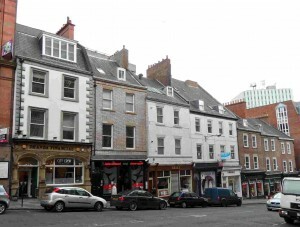 They are located in New Bridge Street, close to Monument, in the centre of Newcastle. They have some photographs also, which might be relevant. I have a man in Australia whose ancestor had a boot and shoe making shop in Grey St on 1851 census.He employed 10 men so it must have been a large premises.His name was Newton. Would you please have any details as my friend is coming to England in December. I work in Lloyds court on Grey street and I’m curious as to what was here originally? I’m researching my family tree and have discovered on 1861 census that our great grandparents lived at 4 Lloyds Court with their young family – he was a blacksmith (shop on the quayside I understand). WRT comments of property where the beautiful Lloyds Court stands in Grey St part of the vista looking up to the monument, you may know now that before its development it was built upon a residence and lands about that were called Anderson Place. A house where Charles I had stayed, plus my family the Andersons had had connections from the late 1400s. John Anderson was sent, after landing at Milford Haven in 1485 with Henry Tudor and helped him usurp the throne from Richard III to become King Henry VII, to Newcastle. Then seen as the second most important city in England. Soon he became Sherif and Mayor, founding a very powerful dynasty marrying into local families of note. They became, with the Selby Family in 1600, the owners of the grand lease, making them the richest commoners in England; it gave them the rights to shipping lanes and most of the coal industry which was then, as Hostmen of Newcastle, one of the first powerful Cartels of 12 families of fuel, namely OPEC of their time. This family were so trusted as Kingsmen that in the reign of Henry VIII, the head of the family obtained a “pardon for committing murder”, I believe, of a man of the name of White. Their rise, fall and re-emergence would fill several books. The last owner of Anderson Place, I believe Major Anderson, was a “character”; he “tweaked the nose” of a Newcastle major administrator and this earned him “6 months hard labour”. I believe he lost his temper at some bureaucrat and led him by the nose about the room at some meeting until it turned blue. Strangely I know of one place where the Anderson Bros Builders left a piece of Anderson Place. This is on Newgate St; opposite the Shopping Centre is an Alley and on the right is 90s Bar BOOM and on the left is a kebab and pizza place called “Yummies”. If you use google earth and use Mr Yellow to go Street Walking, look up at the building, it was rumoured to be built by the Anderson Bros from stone from Anderson Place amongst others. The Alley would have led to The “Nuns” which was a piece of open ground possibly an orchard or gardens in its time as a part of religious buildings, I believe dissolved by Henry VIII (probably by the same lot). So no prizes for how they got their hands on the Place. If you look up to the right of the facade you will see a stone detail of an archer’s hole but also a Coat of Arms. This was the family crest with the Motto “Nil Desperandum Auspice Deo”. It has several translations: my favourite is ” don`t let the **** get you down”. One little piece of history I fished was the discovery I believe of the actual staircase which was of oak and within Anderson Place; believe it or not, it was in an ancestors “farm building” in the rafters for centuries, never heard anything since.